In The Birthright Lottery, Ayelet Shachar argues that birthright citizenship in an affluent society can be thought of as a form of property inheritance: that is, a valuable entitlement transmitted by law to a restricted group of recipients under conditions that perpetuate the transfer of this prerogative to their heirs. She deploys this fresh perspective to establish that nations need to expand their membership boundaries beyond outdated notions of blood-and-soil in sculpting the body politic. 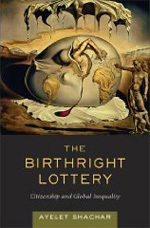 Located at the intersection of law, economics, and political philosophy, The Birthright Lottery further advocates redistributional obligations on those benefiting from the inheritance of membership, with the aim of ameliorating its most glaring opportunity inequalities.